This affects the basic operation of your Transaction center. These settings should be reflected throughout the Transaction center once they are changed. When a Transaction is run in the Transaction Center, this is what it will be set to. This can be changed, but it is recommended to set the default to what type of transaction is done most to avoid incorrect transactions. When a subuser runs a transaction, these will be the options they have. Please note that even if all of these options are available, the user will still need to have rights to perform that kind of transaction as set in their user account. For example, if a user only has the ability to authorize transactions and the only option checked is 'Authorize and Settle', the Transaction type dropdown menu will be completely empty. Learn more about editing user permissions here. Transactions ran using government or corporate credit cards normally will be charged at a higher discount rate by the bank processor. Merchants who accept a large number of corporate or government credit cards AND run these transactions manually via direct card authorization may want to enable this setting to help qualify transactions ran on these cards at the lowest possible discount rate. When this option is enabled, there will be a Sales Tax field in the direct card authorization screen, into which you will type in the amount of the total comprised of any sales tax. EXAMPLE: If the subtotal is $100.00, and 5.00% sales tax is added to make the total $105.00, you would enter $105.00 in the amount field and $5.00 in the Sales Tax field. If there is no need to break down Batch Totals by number of Discover cards ran (if, for example, there aren't many customers with Discover cards) then this option can be enabled so that Discover cards are included with the Visa/MasterCard total. *Only for Retail MIDs. Transactions in the Transaction center require a unique Order ID. If you do not want to create one nor do you have an internal system for keeping track of orders, this can be enabled to have the Transaction Center generate order IDs for you. *Only for Retail MIDs. This determines how long the Receipt Page will display when a transaction is ran. Without a number set, the receipt page will not display. One the refresh rate has elapsed, the receipt will close. *Only for Retail MIDs. Enabling this will allow you to keep track of payments done by cash in the Transaction Center. Useful if you'd prefer to have all types of transactions in one place. This is the email address on file that will always receive reports on batches ran for a given day and invoices for recurring billing. It is recommended this is an email address checked frequently and is used by someone on the account who frequently uses (or is at least familiar with) the Transaction Center. When this is enabled, a user running a transaction will need to enter the CVV2 code for a card?otherwise the transaction will not be allowed to complete. Note: this is different from Fraud Screening settings. 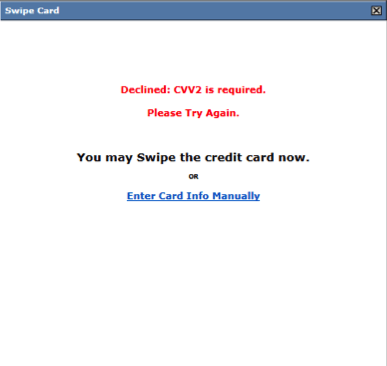 If 'CVV2 should be present but hasn't been provided (S)' is set for fraud checking, the transaction will try to complete without the CVV2 code but the response will be a 'Decline, Please Try again'. When this is enabled, a user running a transaction will need to enter the Zip Code on file for the card being ran. Otherwise, the transaction will not be allowed to complete. Note: this is different from Fraud Screening settings. When selecting any of the fraud screening options based on address provided for the cardholder, it is implied that you will be entering the entire address for every transaction, so using this option in 'General Options' is a good way to provide extra verification for transactions without requiring an entire address. However, there may be some cards with AVS that do not accept only a zip code as a valid address. Please keep this in mind when using zip codes for address verification. *Retail MIDs only. When this is enabled, a user running a transaction will be required to enter the billing address on file for the card being ran. Otherwise, the transaction will not be allowed to complete. Note: this is different from Fraud Screening settings. The fraud screening options based on address provided for cardholder sets stricter criteria for approving a card. The criteria also hold whether the card is keyed or swiped. 'Require Address for keyed transactions' simply requires that an address is provided if the transaction is keyed. Please use this setting with caution! Requiring an address is a good way to verify a card, but can cause a lot of frustration if the address can't be exactly matched with the one for the card. If this option is set to "restricted", there can only be one user logged in for each MID/location on the account. The default, "unrestricted", allows unlimited logins for every MID/location on the account. This is an advanced option. If you would like to have invoices come from a specific source (if, for example, you have an email address specifically setup that you'd like invoices to come from) these options would need to be set so that the emails are properly sent out. If this is not set, invoices will be sent from an automated 1stPayGateway email, invoices@1stpaygateway.net . When Additional email addresses are set, they will get notifications about the options that are checked off (Batches, Recurring Billing, ACH rejects, Payment Page txns) in addition to the main email address. Note that the main email address gets sent these notifications first. The chart display options affect the charts that a user sees when they log into the Transaction Center. The defaults for these are "show". They may be set to "hide" if you do not find them helpful or necessary. At the present time, there are not any methods to customize these charts. When this is enabled, the customer being ran for the transaction will be added to the CIM. This does not check for existing CIM records, so if you do not verify whether the customer is already in the CIM, this may result in duplicate CIM entries. Note: CIM must be enabled on the account to use this feature.